IOCL released the IOCL Southern Region Trade Apprentice Recruitment 2019 notification to recruit new candidates.The overall vacancies in the southern region are 420. Notification about this recruitment is released on In 31st Dec 2018 on the official site iocl.com intimating the application dates are ending on 10th February 2019, the written test exam will be at on Mar 2019. Refer the article to know more info. IOCL Southern Region Trade Apprentice Recruitment 2019 is passed by the officials of South Region Indian Oil Corporation Limited. Applicants have two chances of job appointment from the side of IOCL. One is from the overall IOCL Trade Apprentice Recruitment of 420 vacancies. The one more is the IOCL Southern Region Trade Apprentice Recruitment 2018 for the 420 vacancies in the states of Tamil Nadu & Puducherry, Karnataka, Kerala, Andhra Pradesh and Telangana especially. Then through these recruitments, many of you get an advantage. First, see the requirements of this recruitment clearly and later discuss the application form procedure. After checking the IOCL Southern Region Trade Apprentice Notification details candidates can fill the application form. Indian Oil Corporation Limited has mentioned the IOCL SR Trade Apprentice Application Form for the candidates. This company is the prominent company of central government-owned company in the Oil and Natural Gas Production company. To meet the demands of the people, IOCL has established its related branches in almost every state of India. So looking at all these branches is a very tough task. But IOCL is doing effectively. The recruitments of all these branches are organizing well and good by the recruitment board. At one time, it is recruiting the Apprentice posts for the Northern Branches as well as Southern Branches simultaneously. More interested can apply for both notifications, but here to apply for southern region click candidates can check the IOCL SR Trade Apprentice Recruitment and apply for this 420 posts through @Recruitmentindia.in. Job Location States of South India (Tamil Nadu & Puducherry, Karnataka, Kerala, Andhra Pradesh & Telangana). 01/06/11/16/21 Trade Apprentice (Fitter) – Matric with 2(Two) year ITI(Fitter) course. 02/07/12/17/22 Trade Apprentice (Electrician) – Matric with 2(Two) year ITl (Electrician) course. The applying candidate age limit is 18 years to maximum 24 years as per the norms of the recruitment board as on date 31.12.2018. Aspirants need to pay the application fee as per category wise. Applicants of this IOCL Apprentice Recruitment must get the best salary from the officials. Candiadtes can check the IOCL Southern Region Trade Apprentice Vacancy details after that start filling the application form. The unit that is recruiting the apprentice for the IOCL Southern Region is IOCL of Marketing Division.In all these four branches of the IOCL, there are 420 vacancies.To appoint those candidates IOCL determined to conduct the written exam and personal interview.Collect all the certificate you need to upload along with application form before the starting of application that is on in 18th January 2019. Applicable candidates don’t delay and then apply for this IOCL SR Trade Apprentice Recruitment. Application form of IOCL Southern Region Trade Apprentice Recruitment will activate on in 18th January 2019 up to 10th February 2019 the whole process will be in order to allow the new applicants. Enter the correct mail id in the application form. Further intimates from these recruitment board after the submission of the application will be directly intimated to the applicants through their given email ids.Admit card intimation will personally send to the applicants’ mail id’s only. Candidates who can fill the IOCL SR Trade Apprentice Online Form those candidates can also prepare the syllabus. Candidates if you have any doubt regarding the IOCL Southern Region Trade Apprentice Notification you can check in this post. 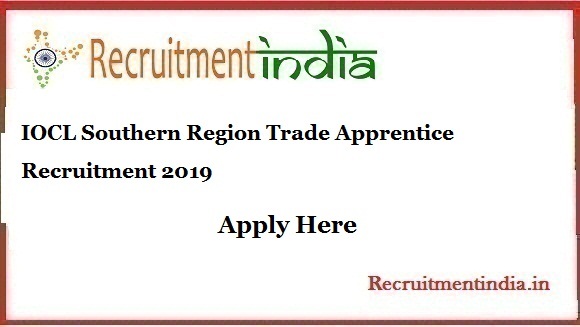 The post IOCL Southern Region Trade Apprentice Recruitment 2019​ || Apply 420 IOCL SR (MD) Apprentice Posts appeared first on Recruitment India.